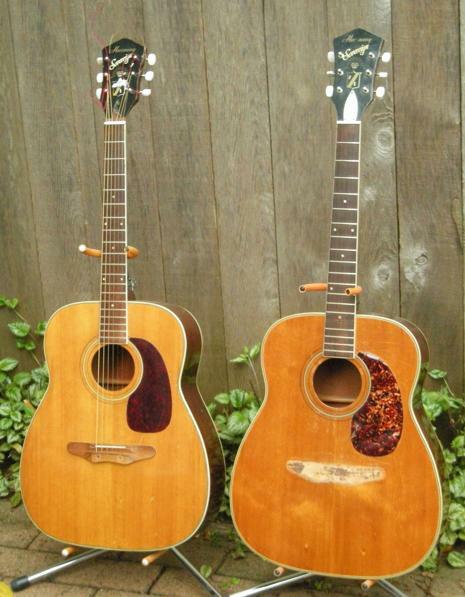 Simon : I have a passion for the Harmony 1260 Sovereign. It is the guitar of my youth. When I discovered that you can buy them on ebay I bought the first one I saw. When it arrived, it looked and sounded like everything I remembered, but it had ISSUES. It needed a neck reset, it had a broken truss rod, and it needed a new bridge and some fingerboard and fret work. 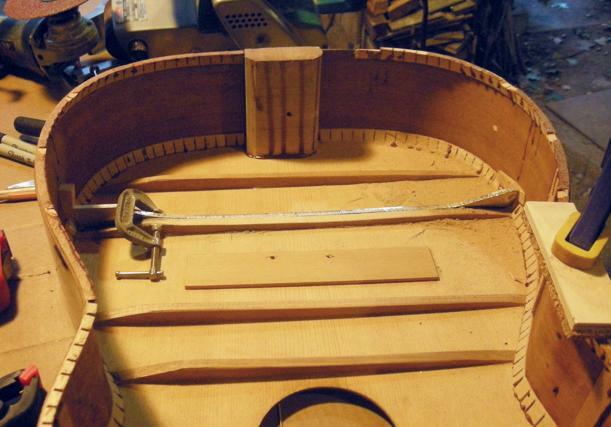 I know nothing about guitar work, but I have been a boatbuilder and I am not afraid to tear into things made of wood, so it looks like I'm going to have to fix it. Inspired by the kitchen luthiers I read about on the internet, I decided to buy a lesser 1260 and practice a few procedures. The guitar I found certainly had more issues than the first. It is the one in the left of the picture. 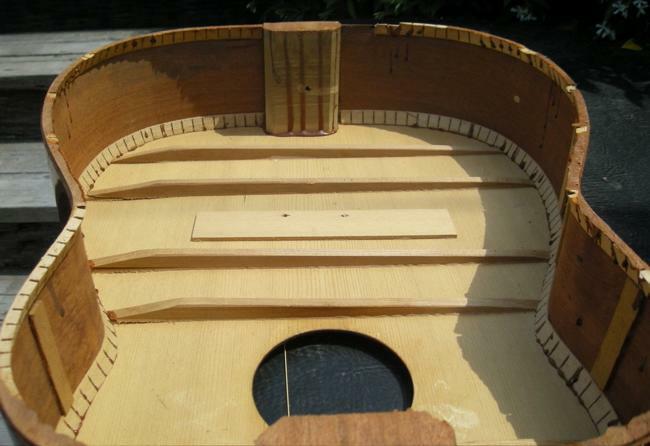 It had no truss rod, it had a bent neck, the string spacing at the bridge was too narrow (looks like the factory did that), the bridge was through bolted to a 2x2 inside the body, all the bracing was loose or cracked, and it had several holes in it. If I crashed and burned as a guitar fixer, I could do so with a clear conscience. This guitar was only inches away from firewood. It was clear that I had to take the back off the guitar to fix the internal problems. 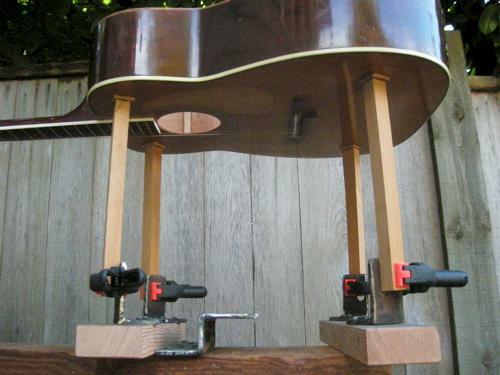 Knowing this as I scanned the internet, I found myself drawn to two sites: Mr. Glynn who describes resetting the neck by adjusting the neck block, and GuitarCapo who writes in a forum about scalloping braces and getting a huge sound as a result. Now that's intriguing. There are no pictures or details, and I'm a bit skeptical, but hey, I'm going inside a guitar that was lost to the world, so why not give it a try? Also, it will give me a little more motivation to get this guitar playing, and not just tear it apart to learn some random procedures. One last thing before I start...although I lay claim to all the ignorance of a kitchen luthier, I should tell you that there'll be no guitar building in my kitchen. Not if I want to keep enjoying the fine meals that I do. I don't mind though, because I have the resources of my old boatshop, and you might feel the occasional twinge of envy as I reach for tools and material that you're not going to find in your kitchen. 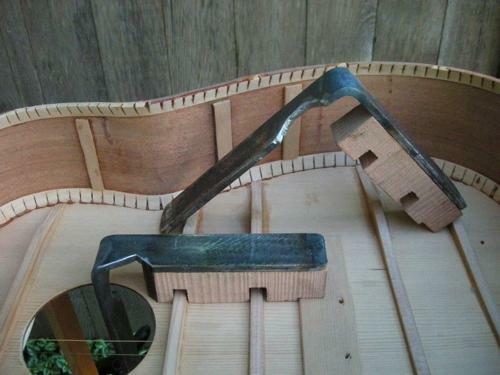 I think I'll call this kamikazie shipyard lutherie. 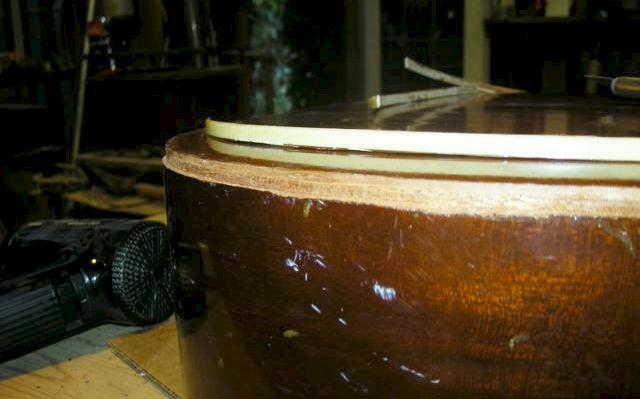 I start with GuitarCapo's words in my ears: "just push the exacto knife between the binding and the mahogany and start cutting". The binding comes off quite easily. I cut for a few inches on the back, then a couple of inches on the side. 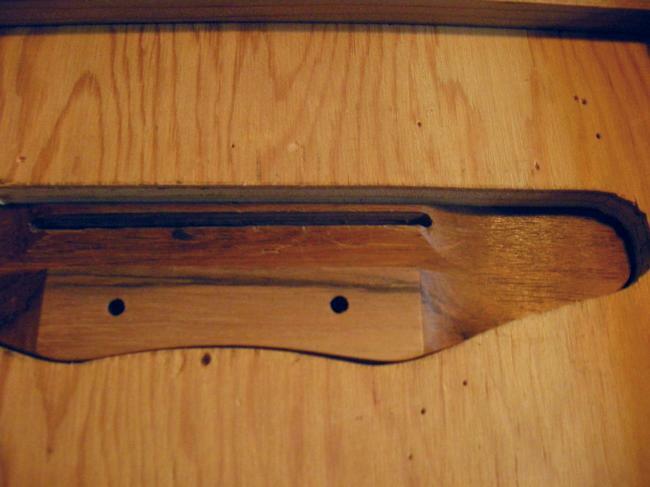 Every now and then the blade slices into the mahogany and a 1/64"sliver stays glued to the binding. I use a hairdryer to try to avoid chipout but it doesn't make any difference. I switch to a heat gun and raise a few cautionary bubbles in the laquer, and it still doesn't make any difference. The chipout, little flakes of missing laquer about 1/16" diameter, will be obvious when the binding is replaced so I'll be needing a strategy to deal with that. Now that the binding is off, the glue joint between the back and the sides is easy to see. It's time to warm up the glue. 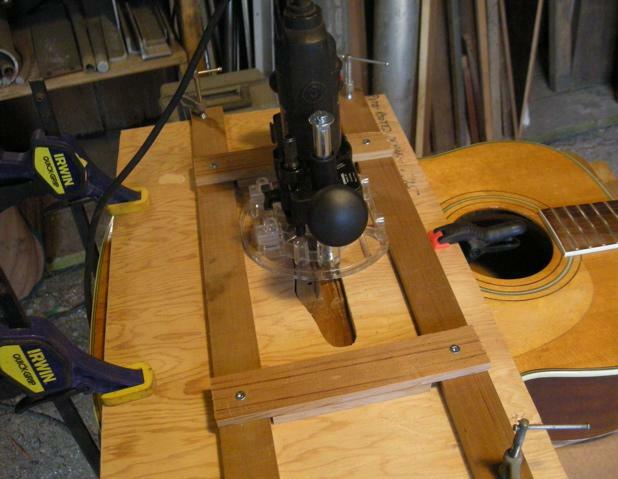 If I really cared about this guitar, I'd use the kitchen luthier's travel iron, but I haven't bought one yet. Instead I warm up the wood with the heat gun and slowly push a thin blade paint scraper into the softening glue. 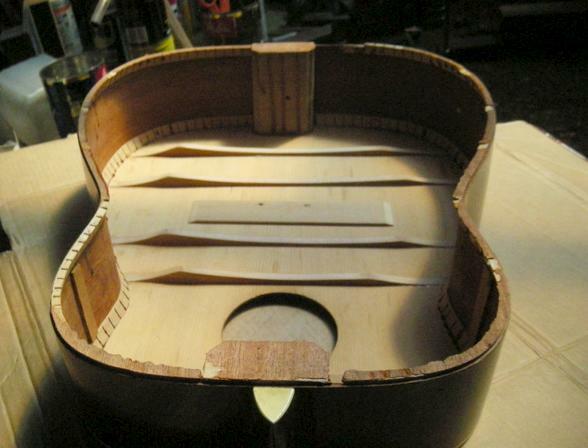 I continue around the guitar, hacking a little harder at the neck block, and twenty minutes later the back is off. There are some areas of wood transfer, but I don't think I should have too much trouble sanding them down later to achieve a decent mating surface. And now the mysterious inner landscape of the Sovereign is before my eyes. As I study the structure, trying to commit it to memory, I remember something I learned a long time ago: "never go to sea without a chart". Hmmm...I'm going to be voyaging here again, I'd better draw a map. I'm now happy that this guitar will not have been sacrificed in vain, and with a clear conscience I'm ready to tear into the bracing. 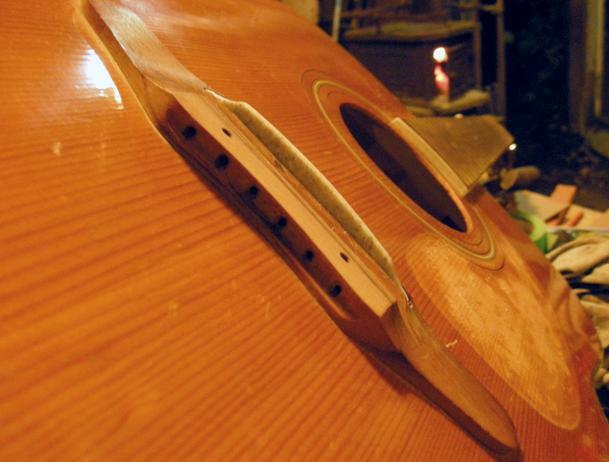 But first I have to reglue the split braces, which is a very simple job with the guitar in two pieces. The only thing I do that might be a little tricky in the kitchen is using the oxy/acetylene torch (unlit, of course) to push the white glue into the cracks. It's amazingly effective; I can see the glue coming out the other side of the tiniest cracks, even though the blast of oxygen turns the glue pasty quite fast. I turn my attention to the top braces and try to come up with a strategy for re-shaping them. I cut into them with a knife and a chisel. They are straight grained and the blade wants to run, and it's not easy to get a good angle of attack inside the corral of the sides. This could be a long job. 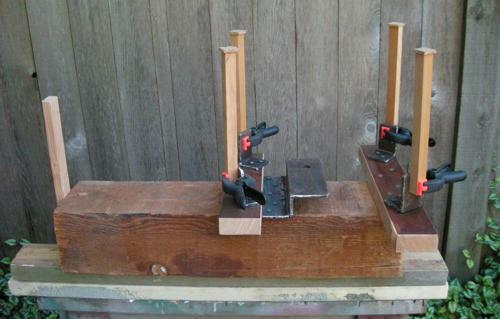 I need a more aggressive approach...why not try the belt sander? The nose wheel fits inside the corral, all I have to do is control the cut. So I go to the band saw and cut a piece of 1/4" aluminum into the shape that I want for the brace, clamp it to the existing brace, and lower the belt sander into the guitar. I keep the sander level and avoid hitting the guitar sides, and the aluminum guides the nose wheel to cut the perfect depth. Now that I know how to do it, it's worth asking "what is the perfect depth". I have no idea, but as I look at my first shaved brace, I wonder if I've cut enough off it to make a difference to the sound of the instrument. I decide that if I'm going to mess with the braces in pure ignorance, I might as well alter them radically. 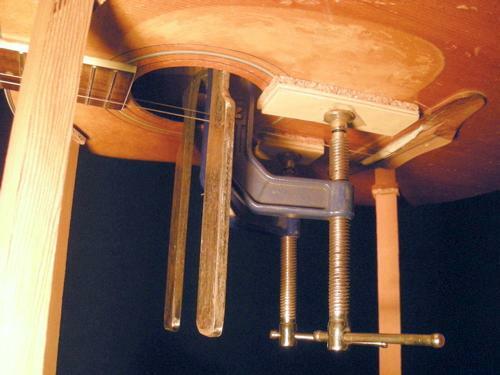 I look at pictures of other guitar's braces and I read that braces can be thought of as upside down suspension bridges. That strikes a chord with me so I draw a suspension bridge on a piece of aluminum and go back to the bandsaw. 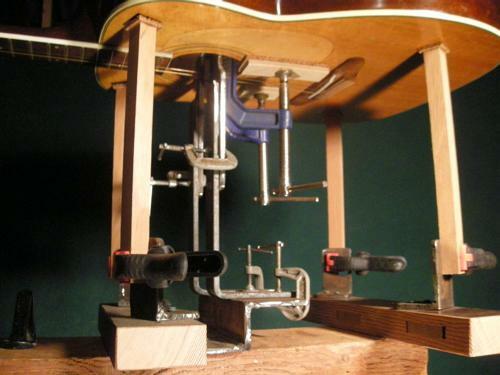 I also make up a couple of aluminum clamps that serve to protect the guitar sides as well. Now it takes just a couple of minutes to reshape each brace. I use the dremel with a sanding drum to shape the approaches to the suspension bridges, and except for hand sanding, the braces are done. Now all I have to do is put the back on and hear this guitar play. But there are two things that I'd like to do first: one is to fix the missing truss rod, and the other is to cut a deeper saddle slot. 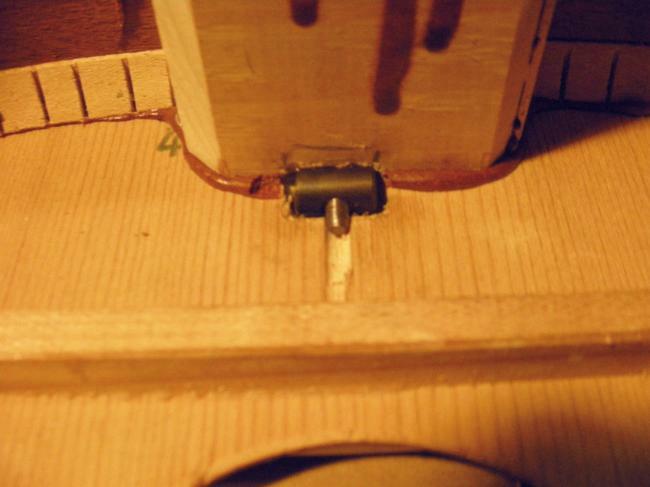 The hole is right under the fingerboard. I expected it to be about 1/2" lower. It's beginning to occur to me that I am following the wrong trail, but I'm halfway there so I'm doomed to continue. I dremel out a little pocket for the heel stop, insert the rod, thread it into the heel stop, spin on the nut and start wrenching it tight. Now I can prove to myself that I am wrong. As I tighten the nut very little happens until it gets REALLY tight... then the relief increases 001". 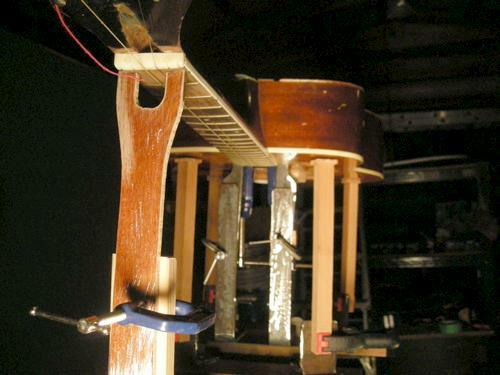 Since the objective of a truss rod is to reduce relief, I need no further proof to convince me turn off the lights in the old boatshop, tuck my tail between my legs, and head inside to the computer and do a little more research. 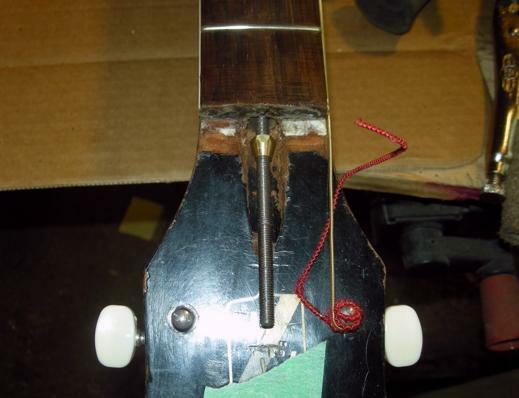 That's where I learn from Louie7 on this website and Frank Ford on frets.com what a 1260 truss rod really looks like and how to repair it. Okay, okay, that's where I should have started. I understand it now, but I'll deal with it later. I'm not going to let this little detail slow my progress. On to the saddle, then I can try out hot hide glue ! Out in the shop I find a piece of nice flat 1/2" plywood big enough to cover the lower bout, and I jigsaw into it a shape that neatly fits the bridge. 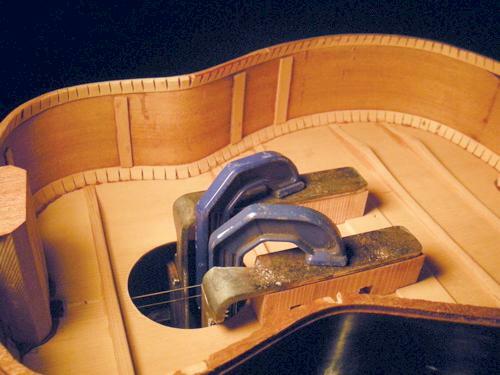 Just two Irwin friction clamps lock the plywood and the guitar to the workmate while one alligator clamp in the soundhole cuddles the plywood snugly onto the top. 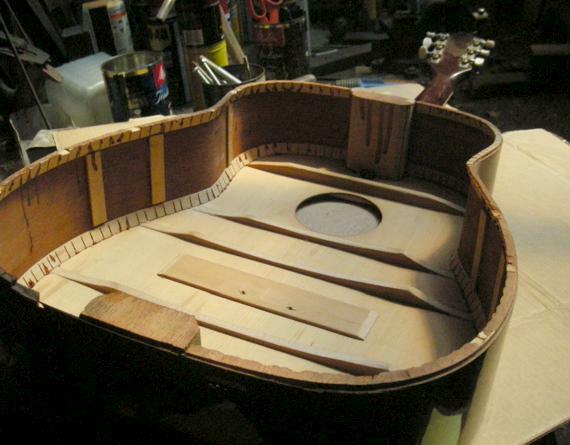 Now it looks like I'm working on a sheet of plywood, not the top of a guitar, and my confidence level is up 50% already. So I use the micrometer to measure, and I clamp a straight piece of wood as a router guide so that center of the 1/8" router bit will track exactly down the center of the 1/16" saddle slot. I could probably proceed at this point, but memories of runaway routers cause me to install a backstop and endstops. Now this router has nowhere to go except where I want it to. The rest is a cinch... I cut the slot in 3 passes, at about 1/8" increments, and it's done. Whew...that wasn't so scary. Did it work? I'd say 99%... I chickened out with the Bosch and instead bought the router attachment for the dremel thinking its mosquito whine would cause me less anxiety. True, but the flexible plastic body of the attachment and the torque of the bit cause each pass to step a couple of thou out of line with the other. I use the exacto knife as a scraper to correct that wee flaw and I'm ready to cut a saddle. And I tell myself that next time I won't be afraid to use the Bosch. Of the saddle there's not much to say, except that it's not white, it's gray. Casting about the boatshop, kitchen lutherie style, for something that comes to hand, I'm not finding any bone. But here's a piece of gray corian from a kitchen reno I did not long ago, and they tell me it's really hard stuff. If I don't like the color, it's offset by the pleasure I get from putting a little bit of the kitchen into my kamikazie lutherie. 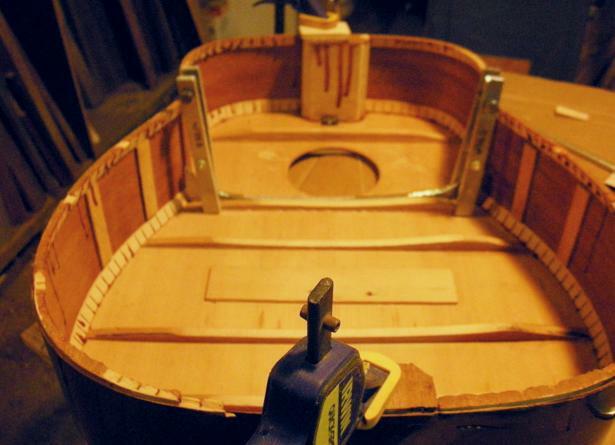 Gluing the back...you might guess I've spent a lot of time thinking about this subject. My first thoughts were to epoxy it. I've got lots of experience with the stuff, it can be thickened to fill gaps successfully, it doesn't shrink, and I'd have about a half hour window to nudge and clamp everything into place before the glue dries. But I soon dropped that idea, partly because it wouldn't teach me anything new, but mainly because I may not get it right the first time, and it would be more trouble to have to cut through epoxy than to melt off reversible glue. So I have decided that this is an opportunity to learn how to use hot hide glue. Scrolling through the internet, I find that I can learn everything I need to know about hide glue, but not much about attaching the back. As I plan how I will proceed I find it helpful to think I've got six hands...clearly I'm going to need a jig. 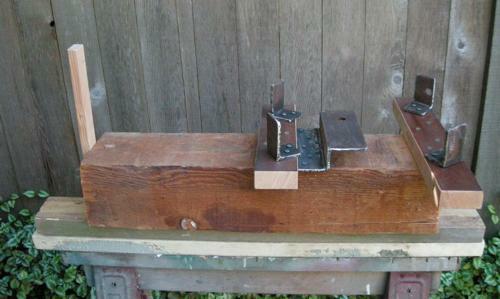 I start my jig with a piece of 6x6 fir that I clamp to a sawhorse. At one end I screw a vertical 1x2. At the other end I screw a pair of 2x4 'wings'. Out at the ends of each wing, I screw a 2" piece of 2"x3"x1/4" angle steel. Then I weld 6" of the same angle steel to a piece of 2" flatbar and screw it to the 6x6. I clamp four 1"x1" legs to the angles, and glue a piece of cork to the top of each leg. 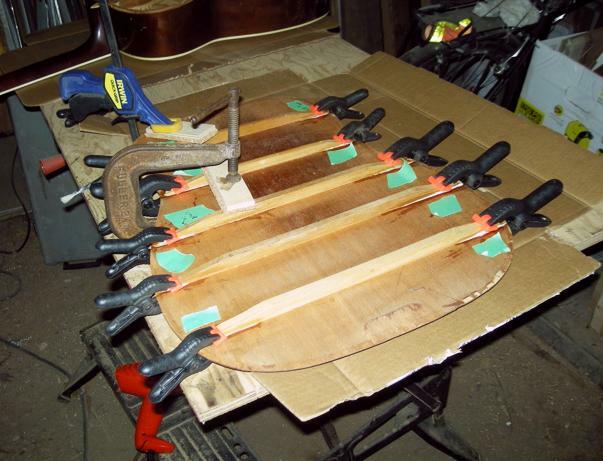 Now I rest the guitar on top of the legs and adjust the clamps so that there is no wobble. Here you can see the two cauls that I made. They are 11/4"x1/4" flatbar bent to a right angle with the acetylene torch, and with a half-moon shape cut out of one side and a wedge shape cut out of the top. The wood block is contact-cemented to the steel, and it's been cut to fit over the braces and bridge plate. 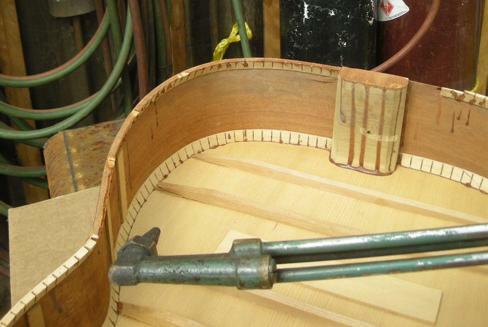 With the cauls clamped in place, you can see what the two notches are for: they allow me to place the cauls and clamps far enough outboard (do they use that word in guitar building?) 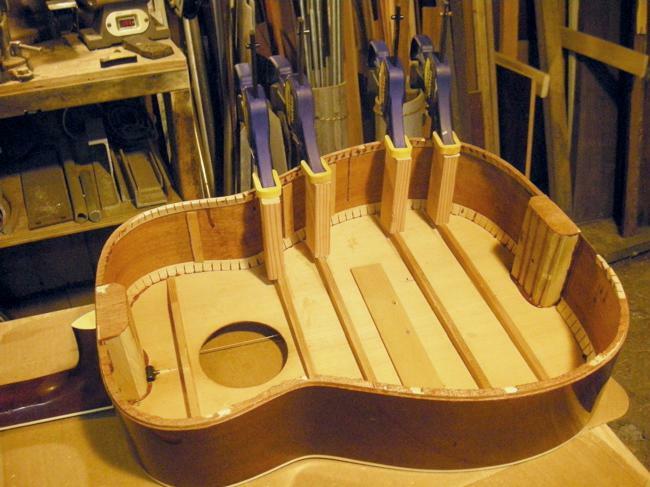 to provide room between them for the two strings that will determine the correct neck angle. Projecting from the soundhole there are two steel tongues that are firmly connected to the top. What I have to do now is connect the tongues to the base. 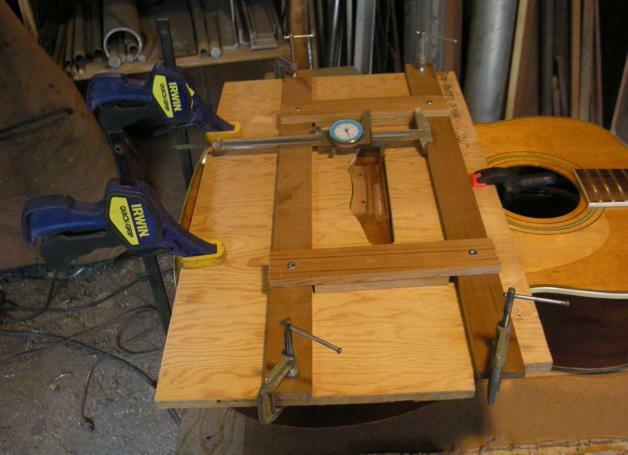 This I do with another piece of 11/4" flatbar bent to 90 degrees, and two small clamps. I am careful at this time to ensure that absolutely no stress is translated to the tongue. That is to say, this last piece of bent flatbar must make 100% contact for the full length of its contact with the base and with the tongue before I tighten the clamp. The first one works out perfectly, and a small wood shim corrects the little difference in angle in the second one. This way I know that the soundboard has been locked into its relaxed position. I know....you're right: it does look like that thing at Science World where the ball starts at the top and spins levers and rings bells on its way to the bottom. But it's simpler than it looks, and now the center of the soundboard of this guitar is solidly connected to a 6x6. 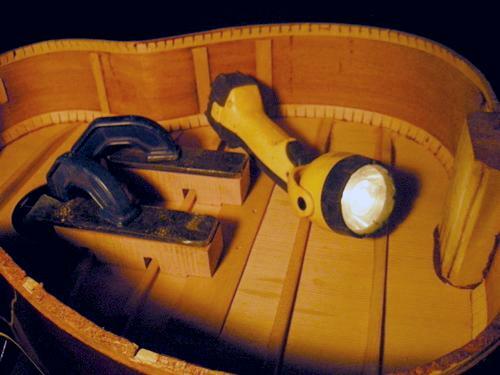 I can lift the headstock about 1/2" and watch the upper bout of the soundboard bend and lift 1/8" off the cork topped legs and I can watch the sides of the upper bout belly out at the same time. And now here's the part that no amount of thinking seemed to resolve: where do I position the neck? The guitar is strung with the D and the G strings to monitor the change in action as I lift the headstock. 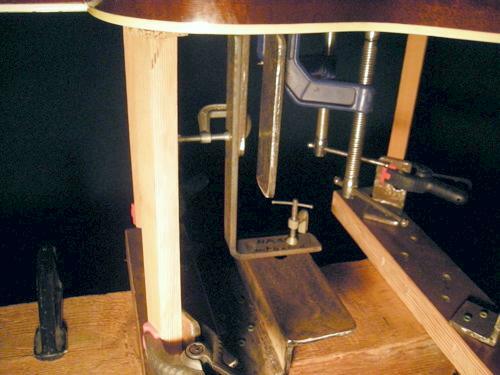 It takes a few pounds of force on the headstock to get the kind of action I want. 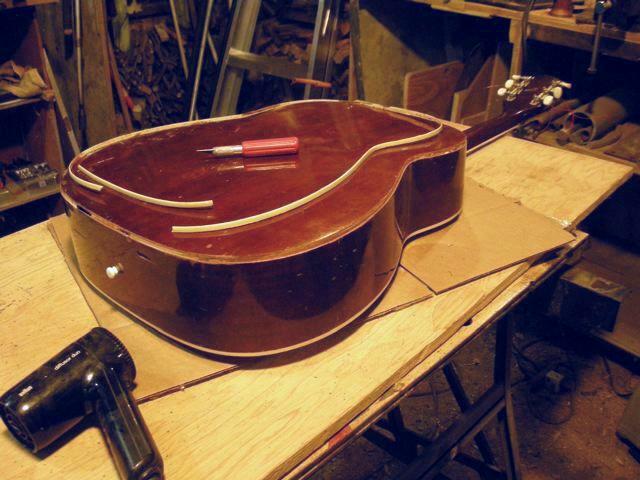 I worry that there will be some spring-back when the guitar comes out of the jig. I also worry that the braces I have scalloped are weaker than they used to be, and that the bridge will belly up when the guitar is fully strung. So it's a shot in the dark. With my eye on the micrometer at the 12th fret, I push up on the headstock till it reads 3/32" and then I tighten the clamp under the nut. Two more things to do and I can warm up the glue pot. I need spool clamps, so I go to Home Depot for parts and spend an afternoon putting them together. 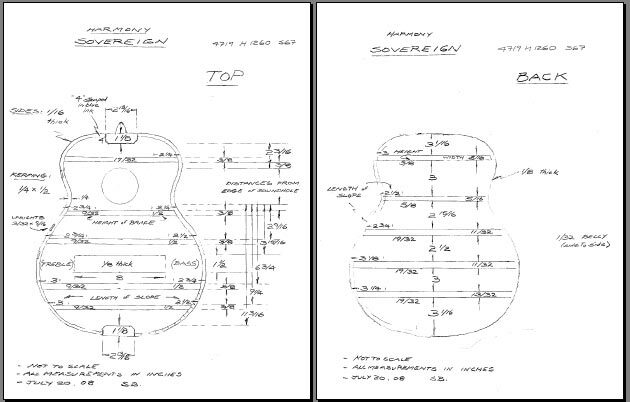 Turns out it's one of the few items more cost effective to buy from the luthier supplier. 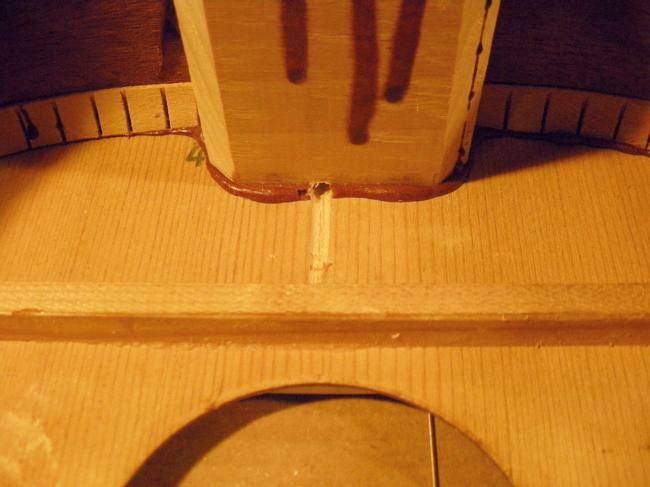 Also, I need to fit the back, to make sure it makes wood to wood contact all the way around the kerfing - no gaps.